Recently I’ve been working with a 90-year-old woman on her memoirs. If you just glanced at the small, frail woman, you would never guess what she’s seen, where she’s been or what she’s accomplished in her life. Like most older people, she doesn’t carry a sign saying who she is, and those who don’t look beneath the aging face miss a lot. To add to the complexity, she’s always been dyslexic. Like most differently abled children of her time, she didn’t get any support or sympathy for her difficulty with learning, or even a diagnosis that she could understand. She was labeled “stupid” for a large part of her early life. Because of that, she has a decidedly low confidence in her ability to write. So how did she start working on her memoirs? Not by writing. She kicked off the project by sitting down for interviews with a friend who recorded every word. In this way, she could simply answer the questions put to her, talk easily and simply about the way her life unfolded, and not worry at all about the commas or the way words were spelled. Now, in the editing process, we’re going back through it and cleaning up the little bits of ramble here, repeating there, and we’re filling out the episodes with more structure and detail. I have no doubt we’ll craft a professional and fascinating book of a story well worth the time and trouble. I know not everyone loves to write like I do. I know some people actually dread it. For some, the idea of sitting down and writing their personal story might feel more like sitting down in a dentist’s chair for a root canal. Yet I sincerely doubt these same people would object to pulling up a chair with a friend and just chatting about their lives. How threatening is that? But where to start, you might ask. What questions should the interviewer ask? Just remember to have a recorder going when you do this. I think you might be pleasantly surprised by the richness of the recollections. I was lucky. 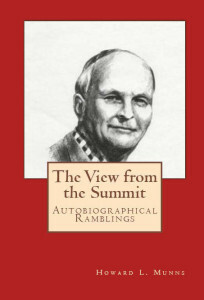 My father wrote his autobiography over the last twenty years of his life. After he died, I scanned in all the typewritten pages, added pictures, and published his story. I had no expectations for selling books or for making money. I just wanted his story out there. It’s the story of our family. It’s the story of America from 1911 to 2002. It’s history. And it’s a rare treasure more valuable than any other. Do you or a family member have stories that get trotted out every Thanksgiving? Stories of childhood antics and family sagas? Stories of love and loss, of friendship, of heartbreak, and adventure? I strongly urge you to capture those tellings before the opportunity is gone. This is one time when I will say, with all confidence and encouragement, you don’t have to be a writer to write. Forget the commas, forget the sentence structure. Trot out that old cassette recorder and start talking, start asking questions. Just start. These stories won’t be available forever. Grab them now. Before they’re gone. Oh, this is so useful. I am always being approached by people who either want to write their own memoirs with my help, or want me to help someone they know write them. This week it was to write a play from someone’s life! Like most writers, I’m already overloaded with my own ideas, but now I have a great post to point them to so they can get started with a memoir project on their own — thank you, Melissa!!!!! Sandra, so glad it’s going to make your life easier. Yes, when I first got involved in this, I thought it was just perfect for those who say, ‘Oh, I can’t write.’ Well, if you can talk, you can write. Okay, it might not be Hemingway, but so what? It’s a start, at the very least. Plus, once people see it all down on paper, then I think it’s *fairly* easy to start adding, fleshing it out, editing. Let us know how it works out for your friends. What a superb post. It encapsulates why I started writing memoirs. I make no claim to skill at writing, although I have learned a bit over the last ten or twelve years. Nevertheless, I have lots of memories, with scratchy notebooks and artefacts to back them up, and heaps of stories to tell, with friends and family keen to hear them. Well, one thing leads to another, and one book leads to another. One day I won’t be here, like many of the people I’ve been writing about in my African Memoir series who long ago joined the ancestors. But the stories will be there for my grandchildren to read, and for other interested souls. I firmly believe everyone should record, in some way or other, the experiences of their lives. Recorders and dictation software make ideal tools for this. Ian, we are perfectly in accord with this. Thinking about all the stories that get lost when someone passes just makes me cry. Not only are you leaving a legacy for your entire family and associated others, but you’re also acting as a prime example of what can be accomplished. With all of us giving encouragement, I hope we can convince many others to set their stories down. Elisabeth–careful; you could start some family wars that way! Just kidding; it WILL be interesting to hear different sides of the same memory. I’d love to hear how your family receives this idea, and what comes of it. I hope you’ll keep us posted. Love this, and can’t wait to read her story. Ninety years old – I’m just trying to imagine what all she’s seen. You know that project for WWII veterans, where they record their experiences? My uncle, whom I never got to meet in person, sent me a recording of his experiences during the landing on Normandy’s beaches, and of his later “sight-seeing” through Europe, and of finally being able to catch up with his brother (my father) on the Moselle River. It’s too late now for me to get more information from that generation of my family, and I can’t tell you how much I regret not trying. So please, encourage family members to record their experiences if they don’t think they could write them down. Drag out that old box of photos like Melissa says. Or start recording your own memories. These are too precious to let go of! Thanks for this post, Melissa. My father was a story-teller, but he insisted on writing his memoirs, which as a result never got finished. If only he’d used the tape recorder! Thanks for the idea about using photos. I’m doing a memoir-recording project this year, and that’s going to be a winner. Gordon, I do hope you’re going to wrap up your father’s memoirs in some way. That’s too valuable to leave it in a drawer. You could always tack on your own continuation where he left off. At some point I plan to add my autobiography to my father’s, and I hope my son will add his to mine. Who knows? We might end up with a couple of centuries of family saga. For me, this post was a sad reminder that my Dad is gone, and that he never did write down those fascinating stories he told me as a child. I did ask him to write about his life and our family, but he had mild dementia by then, and it never occurred to me to simply record him. Your project sounds wonderful, and I know your subject will be thrilled with the final result. Sorry to bring up sad memories. However, there’s nothing to stop you from writing those stories down. Don’t lose them a second time! Everybody has a story. Anyone who’s lived more than 20 years has something to say about the world around them and the world in their own heart. You don’t get to be 50, 60 or 90 without experiencing the best and worst life has to offer. A few bumps and bruises are as valuable as plenty of smiles. Right now I’m working with my parents to capture their life stories on video. They’re both 82, and I really don’t know how much longer I’ll have them around. While the entertainment community – at least here in the U.S. – remains fascinated with larger-than-life personalities, the reality is that some of the most seemingly mundane people have something interesting to tell. There are billions of life stories out there, and each one should have a chance to see the light. Alejandro, I’m so glad to hear you’re doing this. I can promise you it’ll be one of the most rewarding accomplishments of your life. And you’re right; there are some amazing stories behind some very ordinary faces. Great post! That’s exactly what I did. I interviewed my parents over seventeen years to get the story of our family’s century in Shanghai and three-year internment in a POW camp. At first they didn’t want to talk about it—too traumatic—but once started, it just rolled out, and I got much more than I ever dreamed of having. One hundred pages of transcribed information! Besides filling in my own gaps in knowledge, relatives and friends started turning up with more and more rich information. There’s magic in the way it unfolds once you start the ball rolling! Ester, that’s fantastic! Thanks for sharing this with us; it’s nice to know how such a simple idea can turn into a treasure trove of information. And I have a feeling that, traumatic as it might have been to start, it may have been long overdue therapy for your parents to talk about it. So many keep the “bad” stories bottled up, but bringing them out into the light of day often helps to deal with them. What a gift you’ve created for your family. It’s definitely a cathartic experience, and frees your mind to concentrate on new writing ventures. Since publishing, I have been in touch with many who shared similar experiences in Shanghai, and each has a unique story. I’m hoping to collect individual short stories for an anthology. Most appear happy to contribute, and even relieved in a way to know their story won’t die with them. Thank you for this post, Melissa. I have a friend who wrote the memoirs of a lady in her 90s who had been a long-time missionary in India. She was able to use her correspondence as well as to talk with her and her family. She was able to have it published shortly before the lady died. I must say I am sorry that I never had the opportunity to question my grandparents about their lives. I was only 7 when my maternal grandfather died, 12 when my maternal grandmother died and around 16 when my father’s parents died (after almost 70 years married). At that age, I had no thoughts of family history, writing or asking questions. And I spent no time alone with any of them – only cursory family visits or Thanksgiving or Christmas dinners. I have a few memories of them, but not many. My father’s mother, thought to be dead, was almost buried alive. My mother’s father almost emigrated to Australia instead of Canada. Had either of these scenarios happened, I would not even exist. My father died in 1984 and my mother in 2009. Sadly I never thought of questioning them, and neither were storytellers, so I have few memories even of stories that could have been told. All of my parents’ siblings are long gone as well. I’m sure there would have been much of interest to write about had I thought to take the opportunity. Too bad foresight isn’t nearly as productive as hindsight. It is sad how often we come across this sort of story and how difficult it is in our early years to discipline ourselves to listen to, or solicit, the stories of our forebears. AS children we tend to think of them as old fuddy-duddies droning on about ‘the good old days’ and so we switch off our ears. When my mother had to leave her Alaska home due to her health, my sister went back to Alaska to their house to clean it out to sell and get rid of stuff. While she was going through stuff, she found 7 pages where my father had typed out his life lessons and how he learned them. I put those into a book I called Life Lessons: Words of Wisdom Buried in a Box where I commented on his life lessons and added some of my own along with photographs. It is only an 80 page book, but there is a definite difference in writing style between his and mine and I thought people might get a kick out of reading about his life lessons. Had he lived longer, I surely would have encouraged him to write more as the editor of the book surely thought he had a wonderful way with his writing. I have tried to get people who have told me various stories of their lives to record it and I would type it up for them, but I have not had any luck with that so far. Well done you for thinking to do something with they treasure, Jacqueline. 🙂 I would certainly be interested in reading about your father’s lessons. Where can I get a copy? Have you published them as an e-book? It would make a great Kindle Short. Thank you so much Ian for buying my book. It was a treasure to be sure when my sister found his writings. I hope you do see a distinct difference between my father’s writing style and mine. I just wish he were still here to write more. We started a book together back in the early 1990s set in Alaska, but sadly never got very far with it. I hope you enjoy it, Ian.